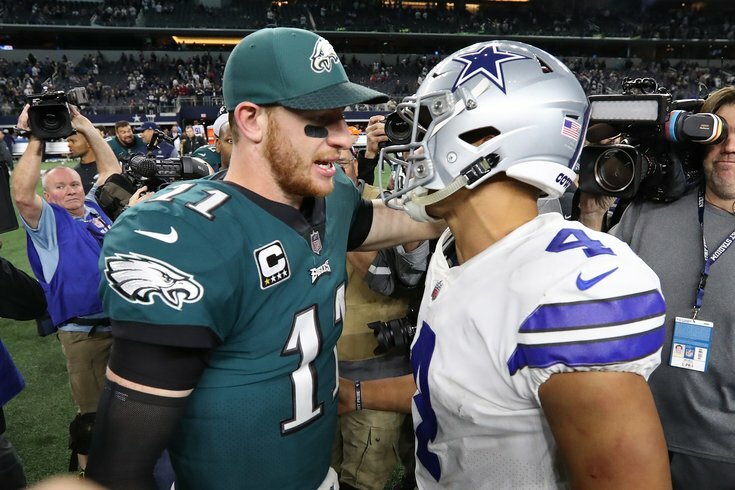 Eagles quarterback Carson Wentz and Cowboys quarterback Dak Prescott. For the gambling degenerates, here are my Week 10 NFL picks. To note, the team logos indicate who I think will win the game, not cover the spread. At the end of the picks, I'll note a few teams that I like based on the spread. Panthers at Steelers (-3.5): Hey now, so this is a Thursday night game worth watching. After a shaky start to the season, the Steelers are rolling, as they've won four straight with a point differential during that streak of +53. Meanwhile, the Panthers are 6-2, and while they have won three straight games themselves, they just don't pass the eye test for me. Is that bad #analysis? Saints (-4) at Bengals: This looks a lot like a "trap game" for the Saints, but laying just four points against a team that has allowed 107 points over their last three games, and will be missing their best player in A.J. Green, is just too good to pass up. Falcons (-4) at Browns: The Browns stink, as usual. How is this line only four points? Jaguars at Colts (-3): This is an interesting matchup between a talented-but-underachieving team vs. a not very talented team that is playing better than expected. Give me the overachievers. Lions at Bears (-6.5): While I believe that trading Golden Tate was the right move for the Lions, I do think it sent the message to the team that they are playing for the future, and not 2018. The Bears, on the other hand, lead the NFC North and will be highly motivated to put a divisional game in the win column. Cardinals at Chiefs (-16.5): Next. Patriots (-6.5) at Titans: In Tom Brady's last five games against Tennessee (he's gone 5-0), the Patriots have outscored the Titans 201-66. This Titans team isn't exactly good, sooooooo I kinda like Tom's chances to smoke them again. Christian, Nsekhe, Roullier, and Bergstrom have a combined 37 starts between them. The Bucs' defense is atrocious, but three backup starters on the offensive line is a lot to overcome, whoever they are. Bills at Jets (-7.5): The Bills are probably the worst team in the NFL. Chargers (-9.5) at Raiders: Eh, maybe the Raiders could also be considered the worst team in the NFL. Take your pick between them and the Bills. Dolphins at Packers (-9.5): The Packers may be the most overrated team in the NFL. I don't love the Dolphins either, but 9.5 points are hard to turn down. Then again, is it foolish to hitch your wagon to Brock Osweiler when money is involved? Yeah, probably, so I think I'll just pass. I'm glad we could work through this thought process together. Seahawks at Rams (-10): This is an interesting game for the Rams, as they'll be tasked with coming off a loss for the first time this season. I imagine they'll take care of business at home against a Seahawks team that still can't protect Russell Wilson. Cowboys at Eagles (-7): The Eagles are coming off their bye, and they are beginning to get healthy again after dealing with one significant roster loss after the next for the entirety of the season so far. They also made an addition at the trade deadline in Golden Tate, who could help spark the offense. Meanwhile, the Cowboys head into Week 10 with bruised pride after a bad Monday night loss at home on national television to the Tennessee Titans. They'll have a short week of preparation in a survival game to go along with a road trip to Philly. Giants at 49ers (-3): Is it sad that I'm actually looking forward to watching this mess of a game? I picked five dogs last week, and four won, but I just can't justify picking any upsets his week, and I'm not going to force it. Byes: Broncos, Vikings, Ravens, Texans. • Picks against the spread: Saints (-4), Falcons (-4), Patriots (-6.5), 49ers (-3).